Duterte’s drug war has been widely recognized by various state leaders, particularly the tough ones. They find such advocacy as effective in cutting out the rampant drug trade. "The war against crime and drugs carried out by you is an example to whole world and, personally, to me. The drug menace is rampant in my country and I feel that we should follow your footsteps to control this hazard." 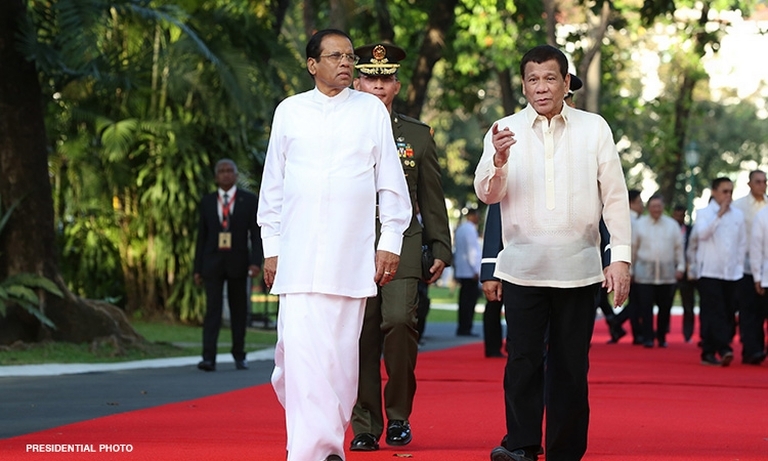 Before the bilateral meeting with the Sri Lankan president, Duterte declares that Sri Lanka could be a potential partner in addressing the illegal drugs trafficking. Duterte has been very vocal about his advocacy to fully stop and cleanse the country from illegal drug use even before the presidency. The fight is ugly and messy, where thousands were killed during police operations. It even became a disturbing issue for those who oppose such an order called “Tokhang.” Labeled EJK has reached the international community’s attention and has been a subject for debates. On the other hand, thousands of individuals apprehended for drugs were put to rehabilitation prepared by the government. According to the government, 4,000 were killed during the operation however human rights groups declared 12,000 casualties.